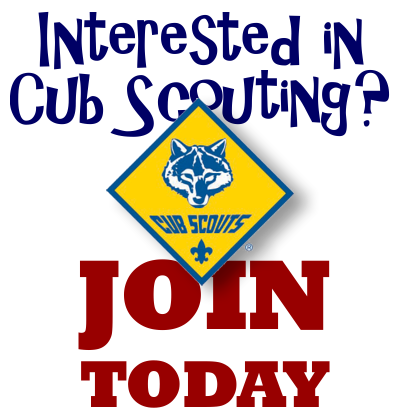 We are so excited that you are interested in Scouting! Pack 202 is for both boys and girls in K - 5th Grades and conveniently serves residents in the Cary, Apex, and Holly Springs area. We have many fun activities throughout the year, including camping, bike rodeos, monthly hikes, fishing, and lots of other FUN activities! We also participate in many special events, such as the annual Pinewood Derby, annual dessert Bake-Off, community service projects, annual Apex Christmas Parade, lots of STEM events, and a Religious Program. In the summer we also enjoy various activities such as Movies in the Moonlight at Koka Booth Amphitheater, Wake County Speedway Racing, Minor League Baseball outings, and the End of Summer Picnic. Pack 202 also plans a large end of the year trip, which has included sleeping on the USS Yorktown Air Craft Carrier (Charleston, SC) and Sleeping with the Fish (Pine Knoll Shores Aquarium). Our pack is very family oriented and we welcome all parents and siblings to all meetings. Pack 202 meets on Thursday nights from 6:45-8:00 at St. Francis United Methodist Church on Kildaire Farm Road just north of Penny Road. If you are interested in joining our pack or just visiting one of our meetings then please send us an email by clicking the button below! Our End-Of-Year Camping Trip will be May 17 thru 19 at Camp McNeill in White Oak, NC, and registration is open! We'll stay at the Western Fort which has indoor bunks for 48 people and spaces for tents outside for everyone else. Activities include Tom Sawyer Rafts (life jackets provided), Gold Mine tunnels and Pirate Ship, along with camping activities like hiking, fishing, gaga ball, and field games. The Pack will handle the cooking for Saturday and Sunday, but plan for your Friday night meal. Scouts are free; any other family members (including adults) are $20/person. All wishing to attend should register as soon as possible! One of the activities that Scouts love the most is going camping. For many parents that have never been camping, this can be a very scary thing. "What do I bring for sleeping, eating, and what do I wear?" We will go over the basics for someone who has never camped. This can also be a good refresher for someone who has only been a few times. No question is too basic. We will have a prepared agenda and camping gear that you can view and play with. Bring your questions; this will not just be us talking the whole time. While this is going on, the Bears will put on a carnival in the back of the room so Scouts don’t sit too long in one spot. We have extended the Cuboree sign-up until after this meeting. Our hope is that this class will give you the needed information to feel comfortable attending the Cuboree at the end of the month. As a thank-you to Saint Francis, Pack 202 hosts an annual service project where Scouts and their families spread mulch around the church grounds. If you're interested in participating, please register! There are two shifts to choose from: 8:30am to 10:00am and 10:00am to 11:30am. The registration for the Black River District Camporee is extended until March 16th. We'll arrive the evening of Friday, March 29th, and leave before noon on Sunday. Activities include archery, BB guns, Gaga ball tournament, Tug-of-War, Team Skis Race Obstacle Course and many others. Scouts are free (due to great popcorn sales this year); parents, guardians and siblings are $15. This is one of the favorite camping trips for Scouts as there are LOTS of things to do and the weather should be comfortable. We anticipate there will even be s'mores for one or two nights! Due to rain, we've moved the pack hike at Bond Park to Saturday, February 23 at 10am. Contact Rebecca Corey at hiking@pack202cary.org with any questions. Q: What's one of the most fun activities that a Cub Scout can do? A: Shooting sports! In order for Council and District to offer these activities, they need trained Range Master Volunteers (training is valid for 2 years). You will be trained and eligible to volunteer for Camporee Ranges (and other shooting sports such as Scout Day Camps) as soon as you complete this half day course.